The announcement that the Obama administration plans to refer more cases to the Military Commissions process rather than federal court has set off another round of debate about the nature of threat posed by Al Qaeda and its surrogates, and it is worth reiterating some of the positions that Amnesty takes on the Global War on Terror paradigm. First and foremost, international humanitarian law conceives of just two categories of armed conflict: international and non-international. International armed conflicts are fought exclusively between sovereign states, not between states and non-state actors. Osama bin Laden can no more declare war on the United States than you or I can. Non-international armed conflicts — for example, civil wars, rebellions, insurgencies — involve fighting between regular state armed forces and identifiable armed groups, or between armed groups fighting one another, but only within the territory of a single State. There are rules that govern both international and internal armed conflict but they differ in certain important respects. Some basic rules — like Common Article 3 of the Geneva Conventions — apply across the board. When the law of international armed conflict or the law pertaining to internal armed conflict applies can differ from one case to the next. The legal standing of Al Qaeda as an entity in Afghanistan may differ to its standing in Pakistan, which in turn may be different to its standing in Yemen, Europe or even the United States. Confused? You should be. In law, this is all a matter of argument as much as fact. It is complicated and often uncertain. Attorney General Eric Holder announced earlier this afternoon that Khalid Shaikh Mohammed and four other alleged co-conspirators in the 9/11 attacks will face trial before military commissions rather than in federal court. This announcement represents yet another disappointing political compromise by the Obama administration. 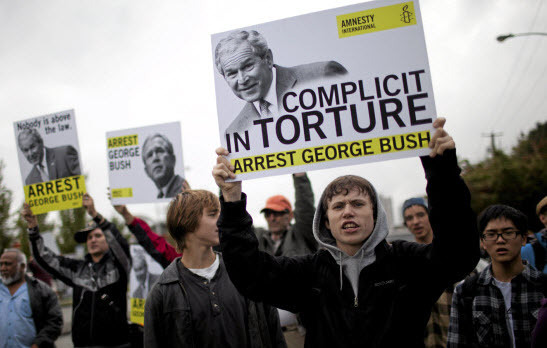 The President came into office pledging to restore the United States’ global reputation by closing the detention facility at Guantanamo and doing away with the widely discredited kangaroo court system cobbled together by the Bush administration. That pledge died today. The Attorney General said he would continue to push back against Congressional interference in the judicial process but, given the spineless performance of the government to date, I wouldn’t bet against Congress having the last word. Military commissions have proved to be a colossal failure. They started off hopelessly weighted in favor of the prosecution. Constant revisions have addressed some but certainly not all such concerns; they have also generated a great deal of cynicism and confusion about the process. In nine years the commissions have only heard six cases, four of which ended in plea deals. That represents less than 1% of the total detainee population that has passed through Guantanamo. So, in addition to lacking credibility, military commissions are neither tried nor tested. By way of contrast, in roughly the same period, more than 800 individuals charged in terrorism-related cases have passed through the federal court system where the conviction rate is close to 90%. In his press conference, Attorney General Holder described the federal courts as “an unparalleled instrument for bringing terrorists to justice.” This rather begs the question: Why has the administration not fought harder to win this battle? The President and his administration should have been out in public fighting for federal court as the proper venue for these trials. Instead there has been a deafening silence from the White House over the past year. The President clearly decided to use his political capital elsewhere. Coming, as it did, on the same day that President Obama announced his 2012 reelection bid, today’s announcement provided a timely reminder of just how little campaign promises are worth.